Dr Madhu Kotiya has been into Palmistry, Numerology, and Vastu Shastra since her childhood. She entered into the Mystic world of Tarot in 1998 and since then has never needed any other method used earlier. Tarot has completely changed her world; Madhu created the Tarot India Network Delhi Meetup Group in 2005 and organized many workshops for tarot beginners. She taught many Tarot Students around the world and their number has grown to 20,000. 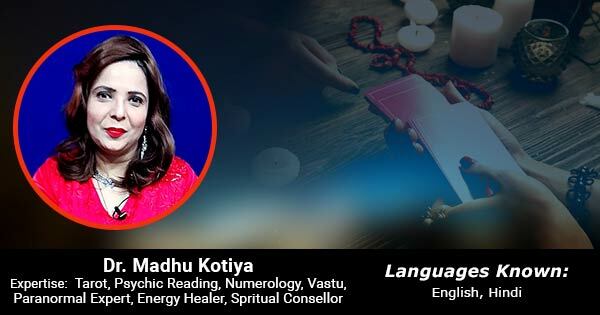 Dr Madhu has also written scripts for many Numerology and Vastu based programs on different satellite channels such as Aastha, Sanskar, DD Metro, Zee, etc. She is also an expert in Angel Therapy/Angel Healing and a Psychic Medium for Ascended Masters and Angels. Apert From being a Taro expert, Madhu is also an Energy Healer. She is a practicing Spiritual Healer & Pranic Psychotherapist, and provides Reiki and Wiccan Healings as well. Her combined therapy of Tarot and Energy healing is a wonderful treatment for depression, fears & phobias, disturbed sleeps, nightmares, confusion, skin diseases, sinus problems, allergies, relationship issues, finance/career related issues etc. Madhu is an expert in Past Life Regression readings and dream interpretation through Tarot & Hypnotherapy. She is also well versed with other scrying methods like dowsing, crystal gazing and more.